Welcome back from the summer, Arrowheads! As you remember from last season, Oliver Queen decided to leave town with new girlfriend Felicity and rediscover himself (and after the convoluted mess of last season, who would blame him), leaving Starling City in the capable hands of his hero buddies. Since we haven’t had a title change, how is it that Ollie ends up fighting crime once again? “The only way out is through.” In the flashback (five years ago, which means we’re getting really close to where the series started time wise), Ollie is in a less refined version of his Arrow getup, hunting down a drug dealer in a city. He gets tripped up and the dealer flees, but does run into a familiar face: Amanda Waller. She takes him for a drink to talk about things, like say his brutal torture & killing of Shrieve from the season finale, and wonders why he hasn’t went home yet. Maybe there’s some doubt on Ollie’s part as to whether he can go back after what he’s done the last few years, so Waller suggests maybe its best for his health to see where this darkness in him goes. And to that end, she drugged his drink and he comes to later in a cargo plane in the air, being given a parachute and told Waller specifically chose him for this mission. What mission? Just a surveillance operation on a place Ollie knows very well: Lian Yu! He gets kicked off the plane and parachutes in, where he immediately gets captured by some soldier wondering who he is. Bad start to the mission so far. Suburban Queen. Meanwhile, its been five months since Ollie and Felicity left town, and they have apparently settled down in suburbia, trying to live like normal people. Of course, it helps one of them (Felicity in this case) is now been left in charge of Ray Palmer’s company, so no worries about money on their end. And during a routine patio chat with the neighbors, Ollie admits he’s got an engagement ring! Wow, how can this bliss get derailed? Future Arrow spinoff: Felicity’s Smoak-in’ Kitchen. The Heroic Trio. Back in Starling, ahem, I mean STAR City (named in memory of Ray Palmer), Laurel and Thea are in costume, speeding on a motorbike after a semi-truck. Thea hops on and starts fighting bad guys (while reminding her co-horts that her code name ISN’T Speedy), and then, Diggle shows up on the truck, sporting some fancy new helmet. Laurel blows out the truck’s back tires, and before they can assess what is going on, another vehicle starts shooting some big guns at them. 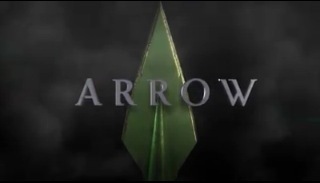 Some of the cargo is taken away by the vehicle, and with that failure, our trio heads back to NOT Arrow HQ to talk. We learn these are attacks by what are called “ghosts”, and they have only increased in the last few weeks, leaving no suspects (on account of the cyanide capsules they chomp on when captured). While Laurel and Thea want to get help, Diggle disagrees, probably because he knows whose “help” they’re going to ask for. Darhk Times Coming. The next day, Quentin and a committee of officials filling in for mayoral duties (because at this rate, redshirts on Star Trek have a higher mortality rate than being the mayor of this city) start talking about filling the mayor’s chair. But then, a mystery man walks in, giving a very big speech about being the head of these “ghosts” and wanting to let the city die off. Oh yeah, and that all their lives will be coming to an end very shortly. Later, as Laurel talks to D.A. about her meeting with this weird guy, the D.A. falls over, poisoned. She rings the Team to get to the other committee members, and by then, Diggle and Thea find their respective targets to protect have been killed. Laurel arrives at Quentin’s precinct house to save him from a heavily armed assault team, and while he’s wounded, he’s still alive. So what was that about not needing help, Dig? Trust Exercises. Laurel goes to warn dad (still working with an arm brace) about the missiles and to find out about any big targets. There we hear him talk about how it seems even after the name change, the city seems to be struggling to stay afloat, not that this talk might be relevant later. Diggle talks to Lyla about Ollie being back, and she–the person who allowed herself to be kidnapped by Ollie–suggests that its time to bury the hatchet on that anger regarding Ollie. At Not-Arrow HQ, Ollie and Felicity learn that they both haven’t exactly cut ties with the rest of the team, although Ollie was just trading recipes, Felicity was flat out helping them. Before we can linger on some new Arrow costume Cisco made, the Team has a location for where our “ghosts” are meeting up. The Team, plus Ollie in a ski mask, arrive at a warehouse (naturally) and witness the mystery man talk to his soldiers and makes a big thing of culling the weakest of them. To that end, he calls out the soldier who led the missile robbery, puts his hand on the soldier’s chest, and proceeds to pull a Shao Khan from Mortal Kombat soul-ripping fatality! After the team has their “WTFF” reaction to that, they start fighting with the soldiers, and in Thea’s case, maybe a bit too hard. The police arrive, and both Team Arrow and our baddies flee, but not before Ollie gets info from the dying soldier regarding where they are going to strike next. “Train”, is all that is said. You Can’t Go Home Again? At Not-Arrow HQ, the Team realize the attack is likely to be the opening of a new high-speed train system between Star and Central City the following day. So the team arrives the next morning in regular clothes, and starts checking the train station for explosives. Ollie asks about Thea’s over eager beating of that soldier last night, and is shooed away, by both Thea and Diggle. Then, Quentin shows up to give him grief about bringing all this darkness to the city, which jeez, no “oh hey, how are things?” to start with? Ollie reflects on whether he made a mistake to come back, if he can be a different hero without bringing the darkness of his past with him, and that talk gives Felicity an idea as to why they weren’t able to find any explosives in the train station. Because its not in the train station, its heading to the train station on the first high-speed train later tonight. 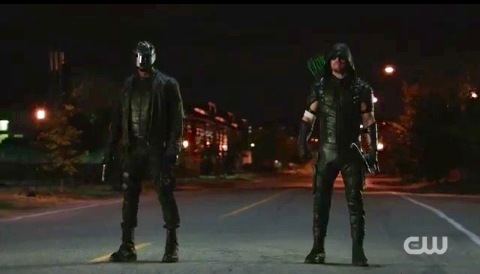 Well, if Ollie’s gonna help, its time to bust out the new Arrow gear. Catch A Train. While Thea, Laurel, and Quentin start evacuating people at the train station ready to celebrate this new train system, Ollie hops onto the train, knocks out some guards, and makes his way to the mystery man. That mystery man politely introduces himself as Damien Darhk, right before Ollie fires a few arrows at him…that stop in mid-air in front of the guy! Uh-oh. And after a beating by Darhk and almost getting the Shao Khan fatality treatment, Ollie is saved by Diggle as Darhk flees the train. But how do they stop the explosives-filled train when its brakes are gone? Well, if you’re Ollie and Diggle, jump off the train and blow it up before it gets to the station! Infrastructure destruction FTW! 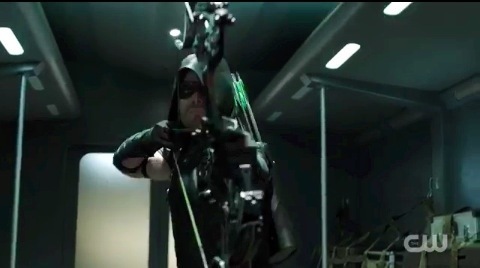 “I am the Green Arrow.” At Not-Arrow HQ, they talk about what Ollie learned about Damien Darhk in his time hanging with Ra’s al Ghul last season, and when he mentions a “hive of agents”, it reminds Diggle of a certain “hive” responsible for the death of his brother. While Diggle’s not quite over things with Ollie, he’s fine with allowing both him and Felicity back on the Team again. But first, Ollie needs to send out a message to the city, and hijacks the signal of the local TV stations. He announces in costume that even though the Arrow is dead, he will fight for Star City as a better hero…the Green Arrow. In Darhk’s lair, he is performing some weird blood ritual and his arms start having words glow out of them, when he’s told he has a visitor. 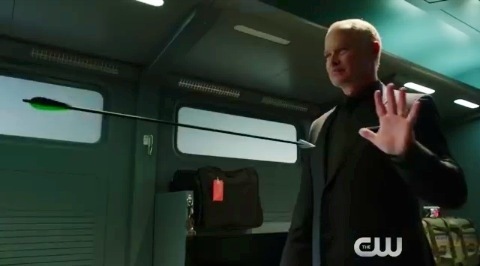 Darhk apologizes for any injuries he might have caused to his visitor…Quentin Lance! What the flying wha?! Quentin’s not happy with the way things are going, and is reminded he doesn’t have a choice in this matter. What is going on? Six months later. So six months later, Ollie’s by a fresh grave, and Barry Allen is visiting. Barry is sorry for what happened and with being busy with “Zoom”, and asks what Ollie is going to do. He says “I’m going to kill him”, before Barry leaves. We don’t see who the grave is for, so your guesses to who’s gonna fill it by the end of the season. Is it Felicity? Laurel? Thea? Diggle? Malcolm? Just kidding about the last one, because Ollie would be peeing on that grave instead of crying over it. But who is doomed for a dirt nap? –Comic book connections: Damien Darhk is the head of the evil organization HIVE, and played here by Neil McDonough, who has played Green Arrow in a recent DC Animated short. Also, Ollie in the flashback is stalking around Coast City, the home turf of another green superhero. One with a lantern. –I don’t think Ollie has smiled as earnestly or as much in three seasons of this show than he has in this episode. –So Thea didn’t come out of that Lazarus pit from last season all normal after all. Looks like daddy might be popping up this season. –No salmon ladder in Not-Arrow HQ? Foreshame!